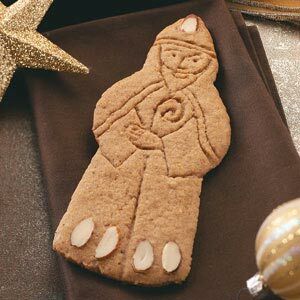 This is an old Dutch recipe for the special cookies that St. Nicholas brings and that are consumed between December 6 and Christmas. Mix together the sugars, shortening, and the butter. Add condensed milk and spices, gradually blending in the flour and baking soda. Crush the almonds with a rolling pin and mix in. The dough will be somewhat stiff. Roll into logs, cover with wax paper or plastic. Cut into slices (use a mold if you have one) and place on lightly greased cookie sheet. Bake in a preheated oven at 375 degrees for around 10 minutes. Traditionally Speculaas are imprinted with some pattern created by a wooden mold. If you imprint the cookies with such a mold, they will look better.